Welcome to Mercedes-Benz Country Hills! 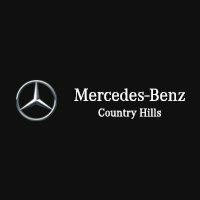 Whether you are searching for a New Mercedes-Benz, Pre-Owned Mercedes-Benz, or need Mercedes-Benz Service, Mercedes-Benz Country Hills is dedicated to providing all of our guests with an experience unique to our dealership. An excellent guest experience is our priority for Calgary Mercedes shoppers, and our expansive dealership has a multitude of amenities all here to cater to you, our valued customers. So drop in and find out about the Mercedes-Benz Country Hills experience. Hungry? Relax in the Benz Bistro and spacious lounge, located near the service drive-thru. Meals made fresh daily and prepared just for you. Ask any of our staff, and they’ll tell you our food is delicious. Meanwhile, let your little ones be entertained in our Country Hills Kids Club while your vehicle is serviced. Schedules can be unrelenting, at Mercedes-Benz Country Hills we get that! If life has you short on time, with a big list of things to do, let us help you out. Speak to one of our Service Advisors about scheduling a Courtesy Shuttle, our drivers will easily whisk you about town. If the shuttle isn’t quite your style we can set you up with a courtesy vehicle from our personal fleet. Regardless, our highly trained service advisors will have you out the door in little to no time. The Brand Specialists at our Calgary Mercedes-Benz Dealership are both personable and knowledgeable, they are all here to ensure you have the absolute best guest experience unique to our dealership. Our brand specialists are here to guide you, and provide feedback so you can make an informed decision about your next vehicle, all the while ensuring that all of your needs are met. Our service team here at Mercedes-Benz Country Hills possesses an incredible wealth of knowledge when it comes to the inner workings of your Mercedes-Benz. Experience exceptional prompt service with our 31 service bays. Whether it be the smallest noise, a mechanical clang, or just a regular service, let the Mercedes-Benz Country Hills Service Team solve your problem.